When you become a Canary or finally realize that MCS is why you’re sick, you hear nonstop about the importance of having a safe home or room in your home where you can avoid exposure and recover from an exposure. However the information tends to stop there. People who know that becoming a Canary is a great likelihood for them and their families, they also want a nontoxic home. With the vast influence of the Chemical Age, where thousands of untested new chemicals were unleashed on the world with no idea of how they would affect life, it is impossible to be truly chemically free. Even if you had the money and knowledge to do everything “right” you have no control over things like acid rain. Add to this Greenwashing, the lies of toxic products with meaningless words like “natural” and “green” and “eco-friendly” on them in the health food stores to cash in on the environmental movement, and it can make your head spin. I didn’t see why I should have to reinvent the wheel. Canaries have been around since humans began manufacturing chemicals. We knew some in the 1980s and a friend of mine’s father became one in the 1970s from working in a plastics factory. Due to this, I had assumed someone would have handy hints for building a safe Canary nest, which does at times feel like a claustrophobic cage. Instead I just found links to shops I could not afford and yet more vague warning to avoid anything toxic. You’ll find those links here, but also Do It Yourself creative solutions by real life Canaries jerry rigging a safe nest together. Many Canaries are in poverty as we cannot work most jobs and have spent all our money on misdiagnoses (like fibromyalgia in my case). Few of us qualify for disability due to the vague and ambiguous nature of our illness and SSI is only $700 a month. Subsidized housing and disability housing is usually not safe for us, even though that breaks the ADA and HUD rules. Canaries have been known to live in canvas tents, their cars, horse trailers, friends’ porches, and one woman Mom knew in the 1980s had a stainless steel room build for her by her husband. Many of us are homeless. In a world of prefab housing, finding a safe home is nearly impossible. I do not say this to scare you, but to stress the importance of a safe nest. Quality not quantity is the goal. Sleeping in a chair even with cerebral palsy (I also have CP) is vastly superior to sleeping on a foam toxic mattress. We might not be able to afford organic blankets but we can sleep with clothing and towels piled on us until we get some. One note, expect to waste a lot of money on organic products and things other Canaries can tolerate. I feel like a failure every day, so I try to remind myself of the things that do work and are safe. If there was a way to do this “right” someone would be very rich selling it. You will make mistakes. Losing your home and all you own is a rather common canary story. It is not just furniture, buildings, clothing and bedding. Due to the adhesives of photo albums, 15 of mine chronicling my world travels and life events and friends went straight into the trash. I don’t know anyone here so no one could scan them for me and I had no storage space. Same with my diaries, started when I was 9, as the paper made me ill. All my art supplies are gone. At first it was devastating but as I stopped having black outs, pooping my pants, and forgetting my name as the toxins were removed, the less sentimental I became. Merciless, I called it. To paraphrase Earth First! “No compromise in defense of Heather Awen!” As a Canary health is the main priority and that means one thing: no exposures to toxins. Quality of life got better without my prized possessions. We were planning our Made in China modern American estate sale which I had entitled “Buy Our Lives” when it hit me. It really was “Buy Our Old Lives.” Life was not over, but it was new and different. We were forced to live in a way that respects the environment and also helps prevent cancer, asthma, birth defects, autism and many neuro-endocrine disorders. Without becoming Canaries we never would have been forced to do the total change. It felt too daunting. If everyone lived like someone with MCS, the health of the humans and planet would improve. Seeing that way, like the saying “It is the end, said the caterpillar; it is the beginning, said the butterfly,” I became excited. I used to be a journalist. I love researching. I love helping people by connecting them to information and services they need. I have ADHD with hyperfocus, so when I am interested in something my brain locks on it like “a pit bull” as my mother says. I have far too much free time stuck in my nest/cage. If I don’t do something, anger, despair, terror, grief and bitterness will kill me. This means that not everything here will work for all Canaries, but it can give you some ideas. Luckily we have less snake oil salesmen trying to con us from our money by preying on our fear and desperation than other ambiguous illnesses, but I suspect that will change. While intensely mourning the loss of the past life, I have begun enjoying the vision of us building a safe new world, nest by nest! It’s hard, it’s maddening, it’s scary, it’s depressing, it’s enraging, but it also wonderful to know that as the world swims in poisons, we are attempting to make safe oases. If all people with MCS knew they had MCS and made the changes in their consuming, we’d have started the road to worldwide health. If people demanded an end to the poisons directly linked to obesity, cancer, autism, asthma, birth defects, learning differences, early sexual development of children, no one would become Canary. 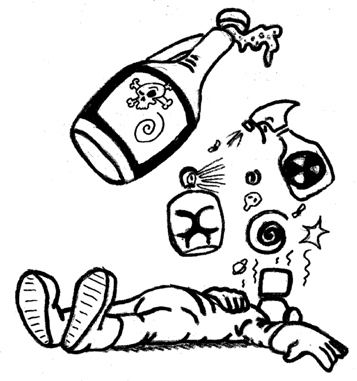 I actually DO wish this illness on my worst enemies: the petrochemical corporations poisoning me and my world.